Browse > Home / Celebrity, Food / Cake Boss: Bartolo “Buddy” Valastro Jr. Originally opened in 1910 by Carlo Guastaffero, Carlo’s Bake Shop was purchased by Valastro’s father, Bartolo Valastro Sr., in 1964. When the senior Valastro passed away in 1994, it was up to 17-year-old Buddy to pick up the torch and carry on his father’s legacy. 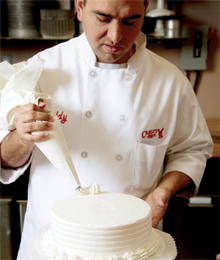 With his mother and four older sisters, Valastro grew Carlo’s into an internationally recognized bakery and television phenomenon. Mixing various types of cake with his “dirty icing” technique and multi-coloured fondant, Valastro has baked and frosted everything from a scaled-down replica of Walt Disney World’s Cinderella Castle to a Ringling Bros. and Barnum & Bailey Circus, complete with fireworks and a ring of fire; to a life-size model of his wife, Lisa. Valastro’s imagination simply knows no bounds. 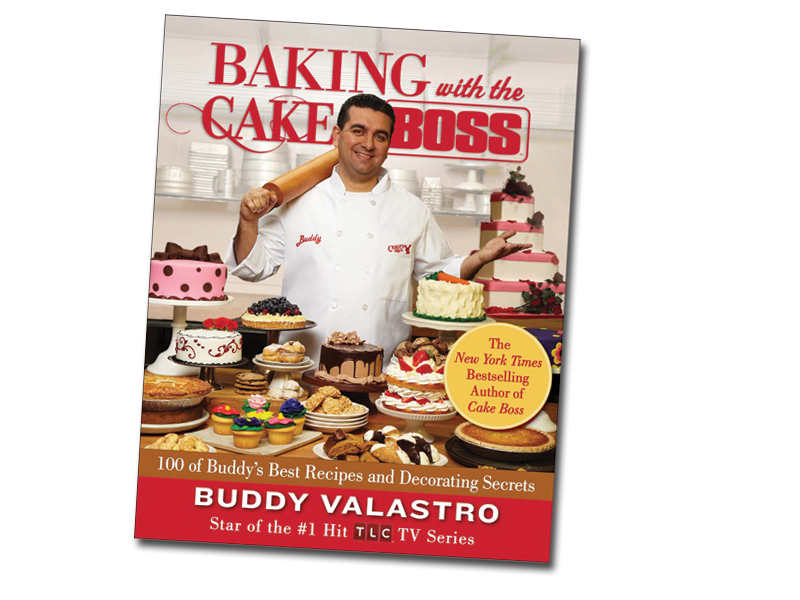 With the release of his second book, Baking with the Cake Boss: 100 of Buddy’s Best Recipes and Decorating Secrets (Free Press, 2011), Valastro gives readers a taste of that creativity, providing a tutelage that progressively guides readers from baking basics to cake mastery. “This book is all about the process of making a cake,” says Valastro, who recently attended the inaugural Canada’s Baking and Sweets Show in Toronto, and toured the GTA to share stories and techniques featured in his new book.“In Baking with the Cake Boss, I get to show people how to make some of our signature store cakes.” From cookies to pastries to cakes, Valastro gradually kneads the essentials into readers’ repertoire, so they’re primed for even the most demanding recipe. 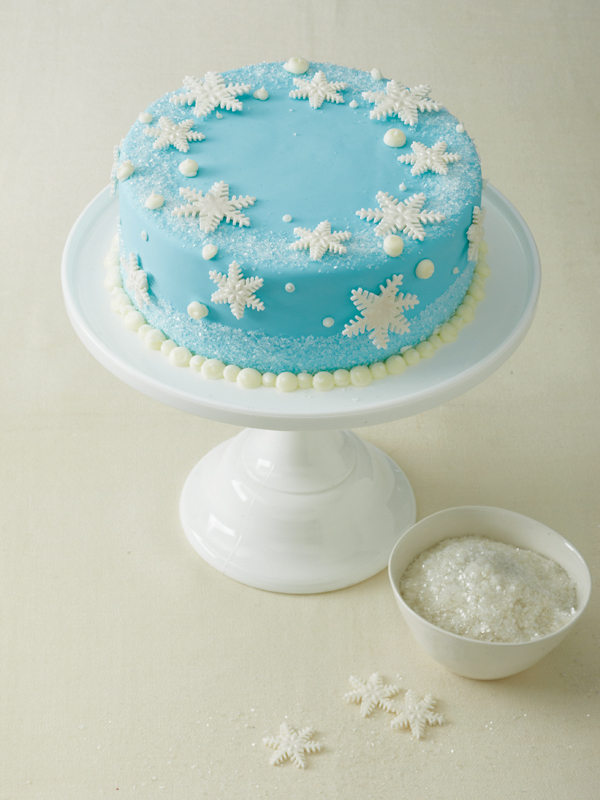 You can try your hand at a Valastro cake with the Snowflake Winter Wonderland recipe (p.60) that’s featured in his book. For this cake, you will need two 10-inch Bundt or Bundt-style pans, 3 inches deep. Note that they should be aluminum, and must not be nonstick or the cakes will collapse while cooling. 1 Prepare the cake: On a turntable, prepare a double-layer cake on a doily-lined cardboard circle, filling it with the filling of your choice and dirty-icing it without the tip (see “Dirty-Ice the Cake”). Note: After dirty-icing, keep the buttercream in the bag for affixing design elements to cake and creating the shell border. 2 Cover the cake: Drape the cake with baby blue fondant, smooth it in place with the smoother, and trim it (see “Apply the Fondant to the Cake”). 3 Make snowflakes: Roll the white fondant out to a 10-inch square, 1/8 inch thick. Use a small snowflake cutters or plungers to make 18 to 20 snowflakes. Use a small brush to paint the flakes with luster dust. 4 Apply frost to the cake: Steam the cake and sprinkle 1/4 cup of the sugar to make a 1-inch border around the top edge of the cake; steam it in place. Sprinkle the remaining 1/4 cup sugar around the bottom of the cake to make a 2-inch border, then steam it into place. 5 Apply the snowflakes to the cake: Pipe buttercream dabs onto the top and sides of the cake and use it to affix the snowflakes to the cake. 6 Pipe kisses: Use the same bag to squeeze-and-pull kisses around the cake. 1 Put the sugar, shortening, butter and vanilla in the bowl of a stand mixer fitted with the paddle attachment and paddle at low-medium speed until the mixture is smooth, with not lumps, about 3 minutes. 2 With the motor running, add the water in a thin stream and continue to paddle until absorbed, about 3 minutes. The buttercream can be refrigerated in an airtight container for up to 2 weeks. 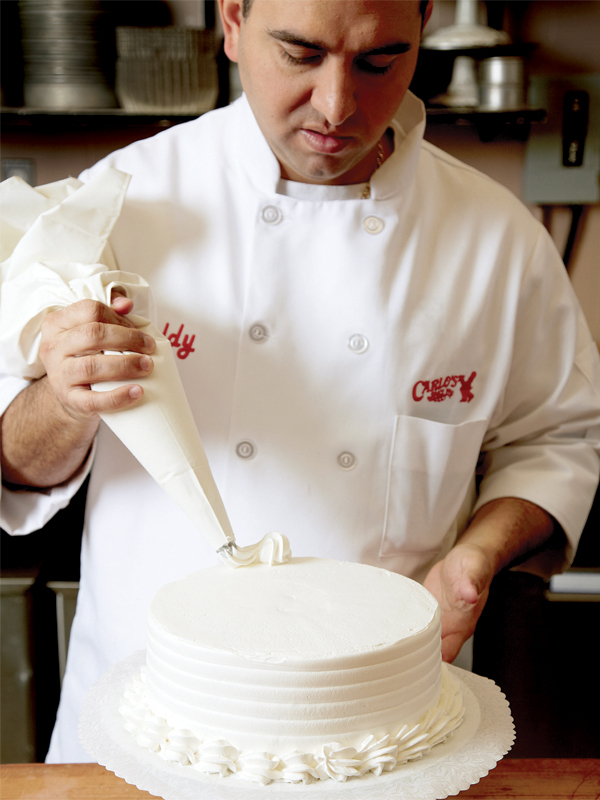 “Dirty-icing” is Carlo’s Bake Shop-speak for what most bakers call a “crumb coat.” It refers to a thin layer of Decorator’s Buttercream that’s laid down as a frosting to help fondant “stick” to the cake. The proper name, “crumb coat,” refers to the fact that you can see crumbs through the icing. It’s not important that your dirty-icing be perfect, just that it be thin and cover the entire cake. To dirty-ice a cake, first ice it as you usually would. Then use a piece of poster board to finish the job, getting as close to the cake as possible. After dirty-icing a cake, refrigerate it until the buttercream stiffens, 30 to 60 minutes. 1 Set the rolling pin at the far edge of the fondant circle and roll it back toward you, spooling the fondant up onto the pin and gently knocking off any excess cornstarch. 2 Bring the pin over the cake, unspooling the fondant and lowering it over the other side, letting it drape over the sides and onto your work surface. Smooth the top with a smoother, then pull and press down gently on the sides to make the fondant taut all around. 3 Caress the fondant with your hands to smooth it against the cake, stretching and pulling it tautly over the top and down the sides, turning the cake and using your fingers to be sure it’s smooth all over. 4 Use a pizza cutter or sharp, thin-bladed knife such as a paring knife, to cut around the base and remove any excess fondant. Lift the excess ring up and over the cake. Ball up the excess fondant and return it to its storage bag; it can be reused. 5 Put the cake on a turntable. Use a smoother to smooth out the fondant on the top and sides. Inspect the cake; if you find any dry spots (they will appear arid and veined), rub a little vegetable shortening over them, then smooth with the smoother. I need to dirty ice a 12 in round cake. Do not believe I need as much as the above recipe says. How much would I need?